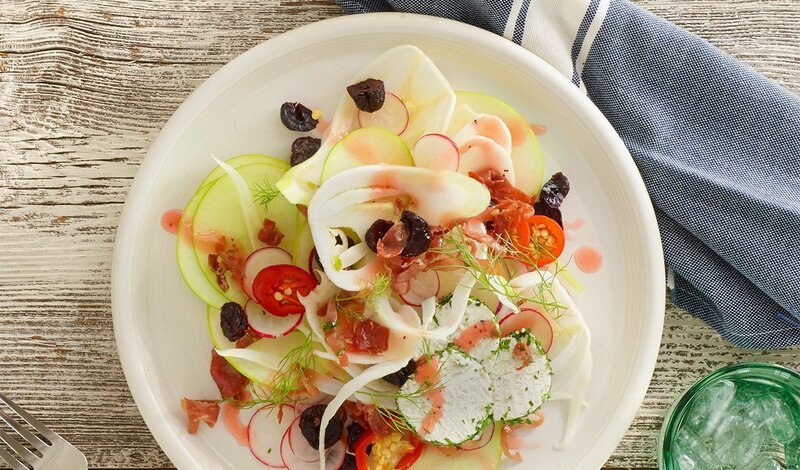 A bright, crunchy and refreshing salad of shaved fennel and apple is topped with pickled dried cherries, herbed goat cheese and crispy prosciutto. Combine all ingredients except the dried cherries in a pan and bring to a simmer. Stir to dissolve sugar and remove from heat. Add dried cherries and cool. Combine dressing, fennel, apple, cherry peppers, and toss until evenly coated. Top with goat cheese slices, crispy prosciutto pieces, pickled cherries, and fennel fronds.